At the end of the Second World War, as in previous wars, the victors reaped the spoils of war. But, unlike previous wars the booty was not just gold, silver and fine art. Modern spoils were found in the technical and scientific wealth of the defeated German state. As death throes wracked the Nazi regime in the spring of 1945, the end of hostilities in Europe accelerated the pillage of the industrial German state. The Americans, British and Soviet Union had already begun to identify and locate material for exploitation. Canada as a major participant in the Allied war effort, scrambled to get a piece of the action before it disappeared behind the veils of state and industrial security. Dr. Paul Larose, National Research Council, at the I.B. Farben plant in Germany, September 1945. DND photo. Unidentified member of the ESTI team, September 1945. DND photo. ESTI arm badge yellow flocked on blue felt. Author’s collection. Under this mandate, research teams were despatched to Europe. The first contingent of nine scientists embarked before VE Day and focused their investigations on science and technology of potential military use in the war against Japan. In the summer of 1945, Brigadier F.F. Fulton organized the main contingent of the JCEST team of 45 select Scientific Investigators. By late summer, they were overseas, focusing on civilian research. SCIENTIFIC INVESTIGATOR slip-on, printed on heavy cotton drill. Author’s collection. 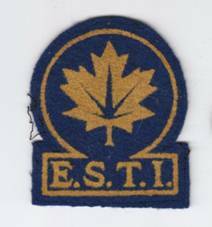 The shoulder patch used the abbreviation EST I, for Enemy Science and Technology Investigator. Made using the flocked technique, it consisted of a maple leaf sprayed in yellow on a circular blue felt base. The leaf was enclosed in a near full circle with a tablet at the bottom of the circle bearing yellow lettering E. S. T. I. At least two hundred of these titles were obtained from Unique Products Co. Toronto. (R.McColm) These insignia identified the members of CJEST as they performed their investigations over the summer and fall of 1945. Burgess F.A. Lt.-Col. for Brig. F.F.Fulton, Canadian Advisroy Targets Committee. “CIOS INVESTIGATORS: UNIFORMS and EQUIPMENT.” Letter. March 28, 1945. LAC RG24 Vol 10040. Canadian Army Photo. “Photo 57239/N.” 1945. Department of Reconstruction File 7-BF-1 (s). “Backgrounder EST I Press Conference.” LAC RG 25 Volume 5713 File 7-BF-1 (s), 14 December 1945. E.B. Wilson, Brigadier. “Clothing and Equipment for Cdn Scientists Memo.” Ottawa: LAC RG 24 Vol 10049 File 13 / Cloth /4 /13, 14 August 1945. Koerner, Steven J. “Technology Transfer from Germany to Canada After 1945.” Comparative Technology Transfer and Society (Volume 2, Number 1, April 2004. ): pp 99-124. 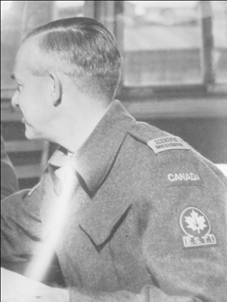 R.McColm, Colonel. “Badges Shoulder Printed Scientific Investigator Badges Emb. 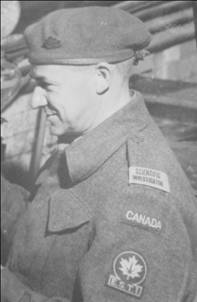 Colored EST I Letter.” Ottawa: LAC Badges Cdn Active Service Force RG 24 Series A Vol 2184 File Hq 54-27-60-3 Vol. 7, 25 September 1945. Secretary of State for External Affairs. “Telegram No 1632.” LAC RG 25 Volume 5713 File 7-BF-1 (5), 16 July 1945. SHAEF, Advance Headquarters. “Establishment of Field Information Agency Technical (FIAT) of G-2 Supreme Headquarters AEF.” LAC RG 25 Volume 5713 File 7-BF-1 (5), 31 May 1945. You can ‘rate’ this article by clicking on the stars, below. You can also leave comments at the bottom of this page. A little short……..but really interesting bit of history,well done.